Baptism, Confirmation and Eucharist together constitute the “sacraments of Christian initiation,” whose unity must be safeguarded. 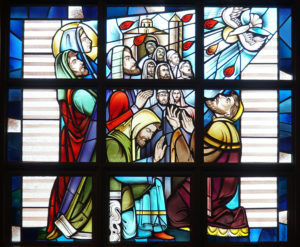 Confirmation perfects Baptismal grace; it is the sacrament which gives the Holy Spirit in order to root us more deeply in the divine affiliation, incorporate us more firmly into Christ, strengthen our bond with the Church, associate us more closely with her mission, and help us bear witness to the Christian faith in words accompanied by deeds. Here at Assumption parish, this program usually begins in grade 7 (Level 7) with the student participating in classes which take place during the week: usually Monday, Tuesday, Wednesday and Saturday (depending upon catechist’s availability). The second year of the program (Level 8) takes place on Sundays from 9:15 – 11:45 a.m. In addition, our Middle School Ministry (MSM) program serves all seventh and eighth graders who wish to participate. They meet on Thursday from 7:00 – 8:45 p.m. Contact Renata Ptak our parish’s Youth Minister for further information: 631-585-8760 ext 121; email, RPTak@abvmcentereach.com. RCIA (Rite of Christian Initiation of Adults) is available for those interested in becoming Catholic and for adult Catholics who have never been confirmed. Please contact our Pastor (631-585-8760, ext. 211 or pastor@abvmcentereach.com to set up an appointment to discuss this part of your adult faith journey.